The stone is actually made from concrete and is glazed. I got to choose four colorways which will blend to make up the tile for the powder room floor. The colors above represent about 80% of those that I chose. You'll see the actual colors when we install the floor in a couple of months. 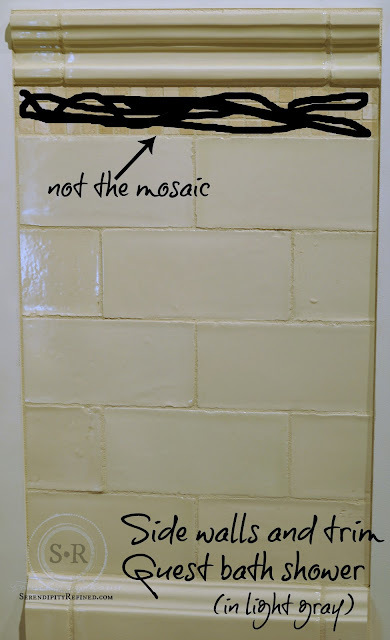 I originally planned on white subway tile for the shower surround in the main hall/guest bathroom. What I ended up with instead was a combination of two different tiles which are hand formed and glazed in light gray. 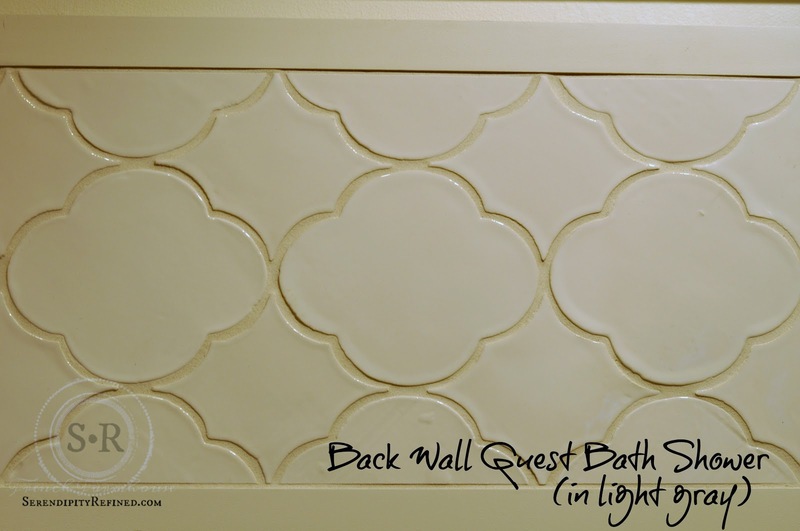 Look for quatrefoil shapes to be used in various places throughout the farmhouse. The tile above will be used on the long "back wall" of the shower. It' what you'll see from the hall when you walk past the bath. On the side or "end walls" of the guest bath shower, I actually did end up using subway tile but as you can see from the above, it's not traditional subway tile. It's hand formed and glazed and has a great rustic and artisanal feel that I'm really fond of. The guest bathroom floor tile is natural limestone. It has a range of colors from gray to ivory to beige. It will be installed in random width rectangles that will provide a casual feeling that is in keeping with French tile installations where they use what they have and the widths are often varied. In the kitchen, I have backsplash tile only between the range and the range hood. It's hard to explain until I share the kitchen layout with you but it's really the only place where I ended up needing tile. 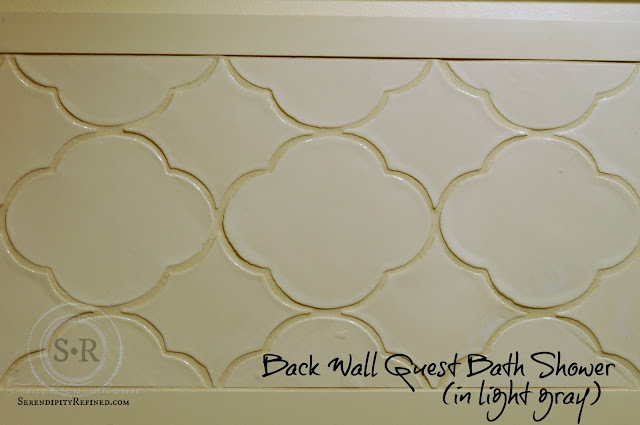 I originally thought that I'd have white subway tile for that space but after I chose my new range, I felt that I needed a more organic and rustic tile. Trust me when I tell you that there has already been a great deal of conversation surrounding using the stone above as a backsplash! I'm not a tidy cook and I cook often. The stone will be sealed with several coats of natural stone sealer and I'm "testing" a big piece to see how it will clean. I'm splattering it with olive oil, tomato sauce and some of the other things that I cook to see how difficult they are to remove from this stone. For me, loving the look will likely take precedent over the fact that it will likely require a stiff bristle brush to clean the stone from time to time. Since the kitchen and hearth room are connected, I also chose to use the same limestone for the fireplace in the hearth room to allow for continuity. I'm keeping things simple and neutral in this house. This is partially because the house isn't large and partially because I like the look of natural stone and wood. 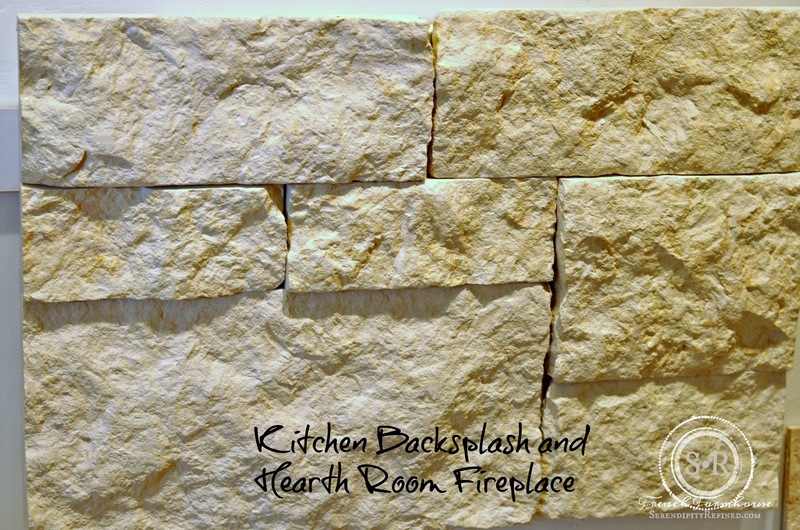 The stone used on the fireplace will probably have a different shape but the color and texture will be the same. 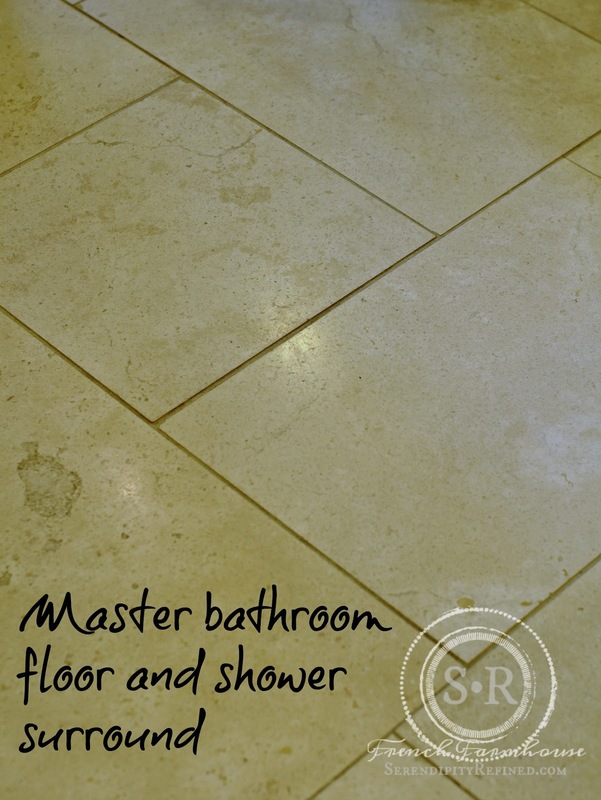 This isn't a great photo but the master bathroom floor and shower surround will also be natural French limestone. The colors in this stone are warmer and range from ivory to tan to slightly yellow. The floor will be the same random width rectangles and the wall around the tub and the shower walls will be a single size of rectangles. 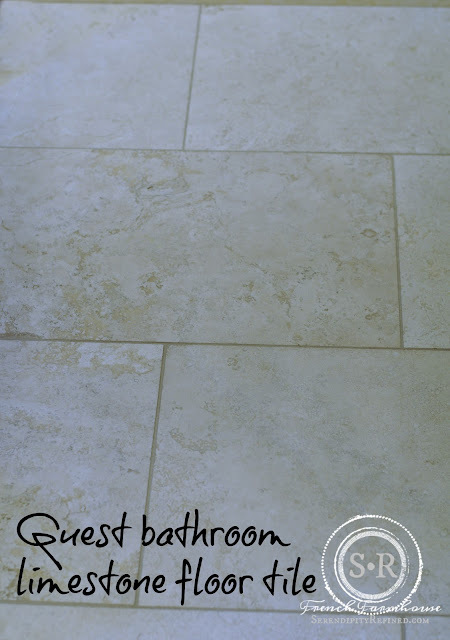 I originally thought that I'd be using gray and white marble tile in the master bathroom but this tile felt more right for the simple, rustic, French feeling that I'm trying to achieve. It's not fancy but to me, it's beautiful in its simplicity. 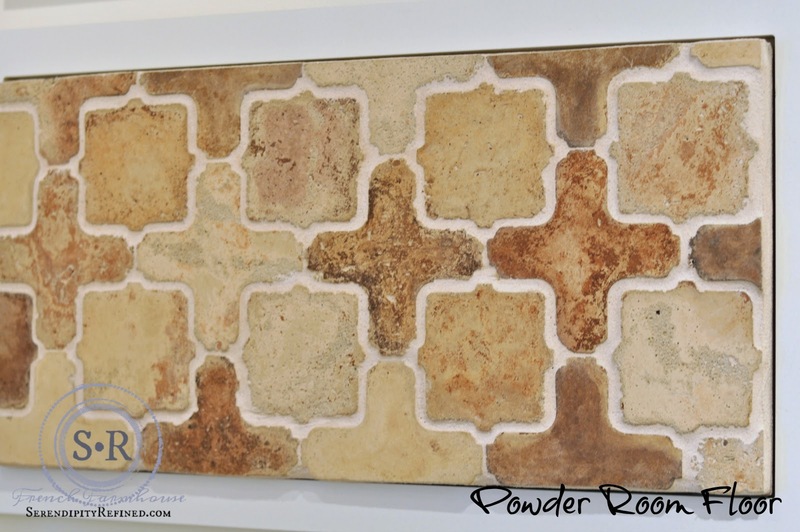 There will be just a little mosaic tile in the shower floor and the niche in the shower which will have the same arabesque/quatrefoil shape that is in the guest bathroom but it will be fabricated from the same limestone that will be used everywhere in this room. There are no photos of that tile so you (and I) will both be surprised when it comes in. 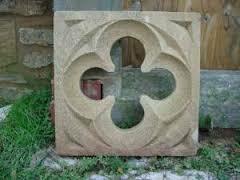 You'll also see a couple of these fabulous limestone quatrefoils in interior walls. I currently have them planned for three locations but we'll see where they end up once the rooms are framed. 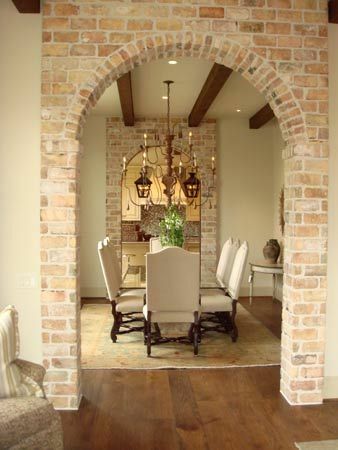 Imagine the brick arch above only it's five feet long/deep and has shelves made of reclaimed scaffolding boards on the sides. There will also be a brick floor leading to the garage from the back of the house. That's it. All of the ceramic and natural stone tile that I'll be using at the farmhouse. It doesn't look like much but it represents a huge step forward in this project. If you follow along on Facebook or Instagram, then you know that I picked up our building permit for Phase 2 of the renovation last week. I can't believe that we're finally starting Phase 2! I'll be photographing the floor plans and elevations to share with you later this week.